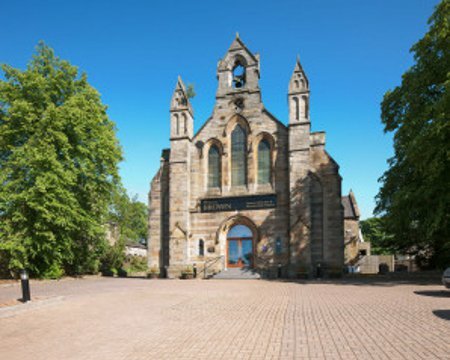 A caring funeral home that serves bereaved families in Broxburn, to the west of Edinburgh. Highly recommended. A very professional service, supportive and helpful. Staff have a kind nature. I would leave 5 stars, except there was a technical glitch with the music during the service, which did ruin the moment slightly. It took up to a minute to correct. They explained everything very well, delivered exactly what they said and couldn’t be more helpful. This funeral home in Broxburn is proud to be a part of Scotland’s largest independent co-operative, with a rich history spanning over 150 years. Thomas Browns are proud to be at the heart of the local communities it serves, with its Broxburn funeral home. Located on West Main Street and was once an old church. There is plenty of off street parking available at the front of the office. Broxburn lies to the north of the M8. It was once two distinct settlements, Broxburn to the East and Uphall to the West. The area now known as Broxburn began to develop in the early 1820s, with the building of the Union Canal. It developed further in 1849 when the railway was built nearby. True professionals through the whole process. Very professional, seemless operation on the day with plenty of kindness from all the staff involved. Thank you very much. I had sympathetic help at every stage from collecting my wife's body to the final interment. Very sympathetic and understanding. The funeral director Graham at the crematorium was an absolute star. Thank you all for your support at this sad time. I would recommend Thomas brown Funerals to any one who has had a bereavement in their family very professional. Very professionally and sensitively handled. Thank you so much. Very understanding and friendly. Guided us through all the procedures and on the day of the funeral were very supportive. The service provided was first class. Everything went very smoothly and everyone was very helpful without being intrusive. The support that Kirsty and the rest of the team gave us throughout this difficult time was second to none. Nothing was too much bother for them. Thank you for everything. very professional but also personal caring. Thank you very much for looking after my dad. Everything was carried out in a professional manner .my family were looked after through the whole process. Excellent professional service throughout a difficult time. Would recommend to anyone. Thomas Brown Funerals will provide you with a free obituary as part of their service.